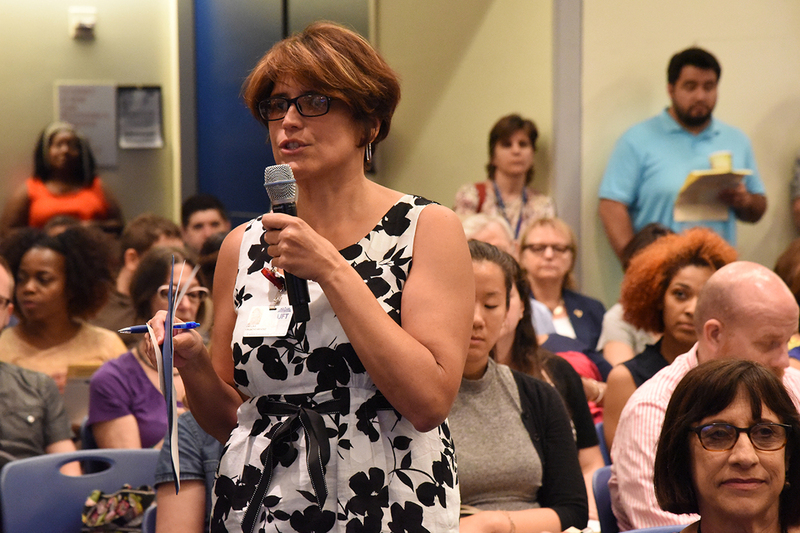 Emma Mendez, the UFT liaison to the DOE’s Division of Specialized Instruction and Student Support, introduces a resolution about guidance counselors and social workers in the ATR pool. The delegates passed two resolutions in their final meeting of the year. The first resolution called for the UFT and the Department of Education to work together to find a better system for assigning social workers and guidance counselors from the ATR pool to schools. The delegates recommended altering the current rotation system so these educators have sufficient time in a school to meet the social and emotional needs of their students. The other resolution condemned the heinous nightclub shooting in Orlando and offered support for that city’s residents. The resolution also called for fighting for stronger gun laws, promoting tolerance and diversity, and taking part in the Pride march on June 26. UFT President Michael Mulgrew said the New York City public school system, with the UFT leading the way, has moved forward further and faster than any school district in the state — but the work isn’t finished. making sure schools are sufficiently funded. Mulgrew said the union is responsible for all of the lobbying on behalf of the city’s public schools. Which is why every school should have more than enough money to operate properly, he said — even if the principal tells them differently. “If you met enrollment, you have more money,” he said. One way the union will help ensure the system is managed better next year will be to address the root causes of teacher turnover in certain schools. He told chapter leaders they would be receiving a survey from the union asking them to report the turnover rate at their school and, if the school has high teacher turnover, to pinpoint the cause. There are some instances when turnover is not caused by poor management, he said, such as when a school is closing. But in cases where poor management is to blame, Mulgrew said, he would like the issue to be openly discussed in those schools next year. Mulgrew urged chapter leaders in schools where turnover is a problem to broach the issue at the first consultation committee meeting with the principal in the fall. In his end-of-year wrap-up, Mulgrew said the union achieved several important goals this school year, such as establishing stronger school chapters and offering more support to the union’s newest members. “Our chapter advocacy program was quite successful and we are looking to expand it,” he said. Mulgrew thanked the delegates for lobbying and participating in the union’s social media campaigns. Member activism paid off, he said. The final city budget had a 27.5 percent increase in Teacher’s Choice funding, and the city is taking steps to make its specialized high schools more diverse. The meeting began on a somber note, with members standing for a moment of silence for the victims of the nightclub shooting in Orlando, Florida, on June 12.